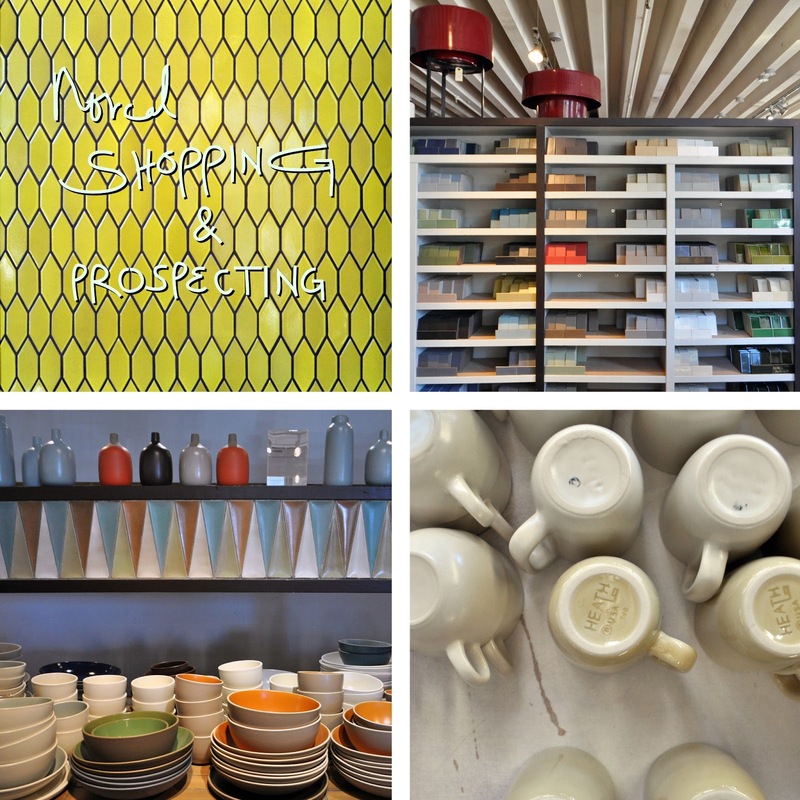 One of the main reasons why we went on our recent Norcal road trip, unbeknown to Antony naturally, was to visit Heath Ceramics in Sausalito. I wanted to check out their overstock factory to get some ideas for potential tiles and patterns to use in my mom's future house. The price of overstock and second quality items are marked down which is essential because I'm working with a strict budget. We also took a guided tour of the factory, and both Antony and I bought some goodies for the apartment. Of course I picked up other things along the way in Big Sur and Berkeley. Above are a few shots I took inside the Heath factory store. You can see and feel the spirit that goes into every piece because each ceramic object is handmade and intricately crafted. The story behind the two mugs on the right is that Judith Heath was a heavy smoker and wanted to make a mug that could allow you to drink coffee and smoke a cigarette at the same time. Hence the off center placement of the handle which is meant to be used by the ring finger, relieving the middle and index fingers to hold a cig. The white one is mine and the black one is Antony's. 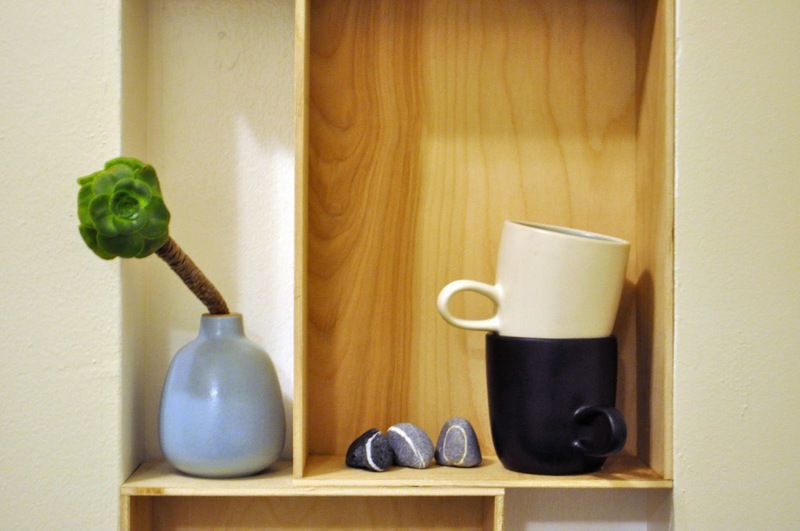 We got the mugs chiefly for their quirky factor because neither of us smoke or drink coffee. The vase on the left was just too cute to pass up. It has such an iconic shape and the color is the loveliest hue of blue. The rocks in the middle I picked up while prospecting at Jade Cove Beach in Big Sur. Each rock has a striking white ring around it which I assume represents a certain period during the rock's life when there was a change in the weather or tide, like the rings of a tree trunk. Predictable me made my way to Jeremy's when we visited Berkeley and surprisingly didn't get any "can we leave now?" looks from Antony the entire time I was digging through the racks. After trying on a few too many pieces I narrowed the selection down to two winners, an A.P.C. silk lavender dress and a leather moto jacket. There can only be one winner and I chose the moto jacket out of curiosity and rebellion. Jeremy's is a discount high-end store so it sometimes carries clothes from prior seasons or clothes with some minor defects. This moto jacket's "defect" is that it has absolutely no brand because the label sewn on is half torn off. The only tags on it is the price tag showing the original price and a tag telling you how to wash and take care of the leather. I like the idea of wearing something brandless. Plus every girl needs a leather jacket - it's versatile, durable, and classic. In Buenos Aires, I found my shopping haven in Palermo. Unfortunately I only had half a day to shop there. Plus I had to pretend I was not a shopping maniac to BDF... so we merely strolled from store to store instead of sprinting. I don't know what it is about being abroad, but I just had the strongest shopping urge. I suppose it's the grown-up version of my childhood wistful greediness at souvenir stores. Armed with this design*sponge guide, I mapped out the stores I wanted to visit. Check out my loot below. On the way to buy soap at family-run Sabater Hnos, we passed by Alfonsina Fal. The little vignette I saw through the doorway was enough to draw me in. I emerged triumphantly a sweaty 20 minutes later with 2 pairs of shoes. (Let me explain, it was on the 2nd floor and sunlight was streaming straight in!!) The platform sandal was everywhere in Buenos, and I knew I had to find a pair to bring it up to the States. 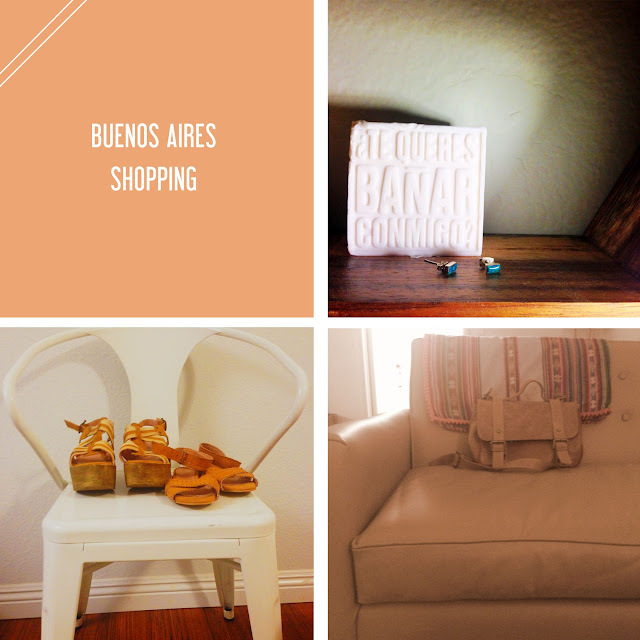 The other items pictures are not from Buenos. The earrings and the pom pom blanket were purchased in El Calafate in Patagonia. Here's photos of El Calafate, in case you want to know why we went there. Of course, I can't end without discussing the item we spent the most money on: FOOD. Grass-fed beef sure is delicious. 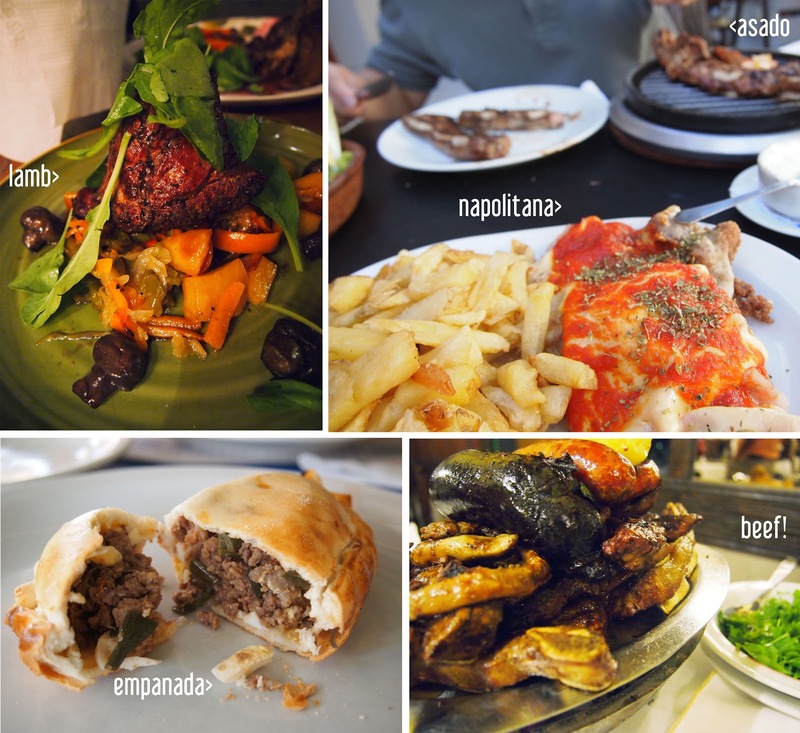 Meat is very plentiful in Argentina, and it's cooked every which way. Grilled, steaks, in an empanada, and my favorite - Napolitana. Milanesa is breaded and fried, and Napolitana is like Milanesa but with cheese and tomato on top. Hands down, we agreed on our favorite meal at El Federal, which had traditional Argentine fare like lamb. There must be something magical about the cows in Argentina because the dairy was just dreamy. Dreamy dairy. Dreamy dairy. We enjoyed plenty of cafe con leche, the cheesiest cheesecake, cheesy pizza, and so much ice cream that I've converted BDF to loving ice cream. Also, I lied about BDF's favorite meal. 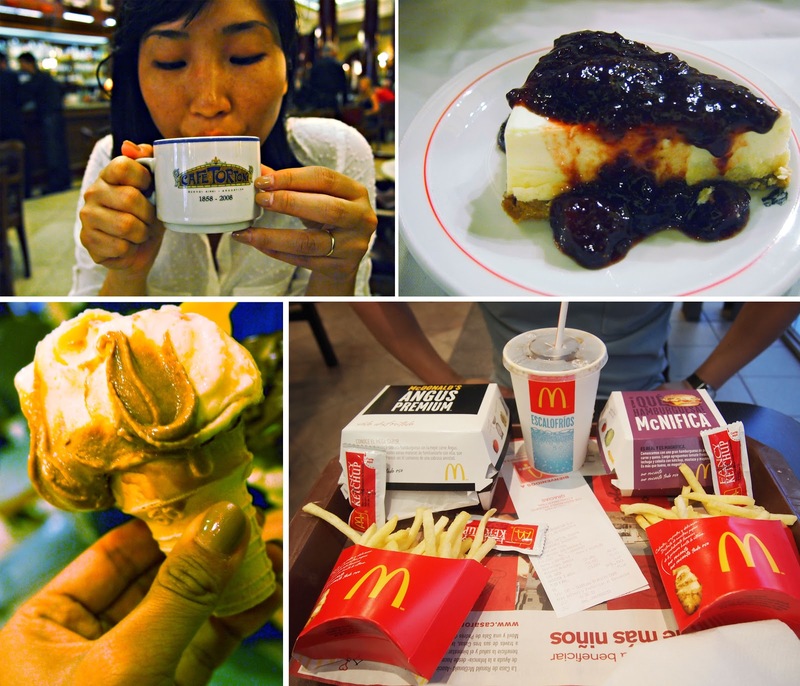 We waited until the last day to try out what McDonald's offers in Argentina. The McNifica had the best name, but it wasn't as good as the name might lead you to believe. All in all, it was quite a culinary adventure, and I have 3 extra pounds of blubber to prove it.